Pindar and other ancient writers are very detailed in the description of Rhodes in their manuscripts. The origins of Rhodes are connected to a divine myth about Zeus (leader of the ancient Greek gods) and Helios (god of the Sun). According to this myth, after Zeus's victory against the Giants, he decided to divide the earth among the Olympian gods; The only god who received nothing was Helios. He, according the myth, was absent and "No one remembered to include him in the draw"! When he came back he demanded his share, but Zeus told him that he was not able to make the cast again because the rest of the gods would not agree. Helios was disappointed but asked Zeus and the other gods to promise that the land that was to rise out of the sea could be his. Rhodes was known in ancient times by several other names, such as Ophiousa (because a lot of snakes lived there), Asteria (for its clear blue and starry sky), Makaria (for its arresting beauty) and Atavyria (after its highest mountain, Atavyros). 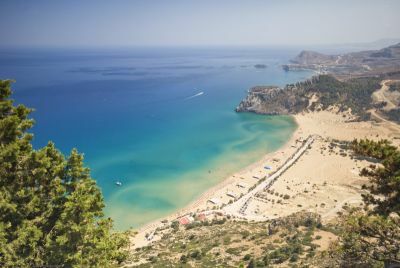 Another name for Rhodes was Telchina, because its first inhabitants where said to be the Telchines , gifted metal workers who lived on the island in the Prehistoric Age. The first known 'human' inhabitants were the Carians, a tribe, which came from Asia Minor . The Phoenicians, great merchants who made Rhodes an important commercial centre, followed them. Their leader Cadmus, who introduced the first alphabet, founded the first Phoenician colony on Rhodes Island. 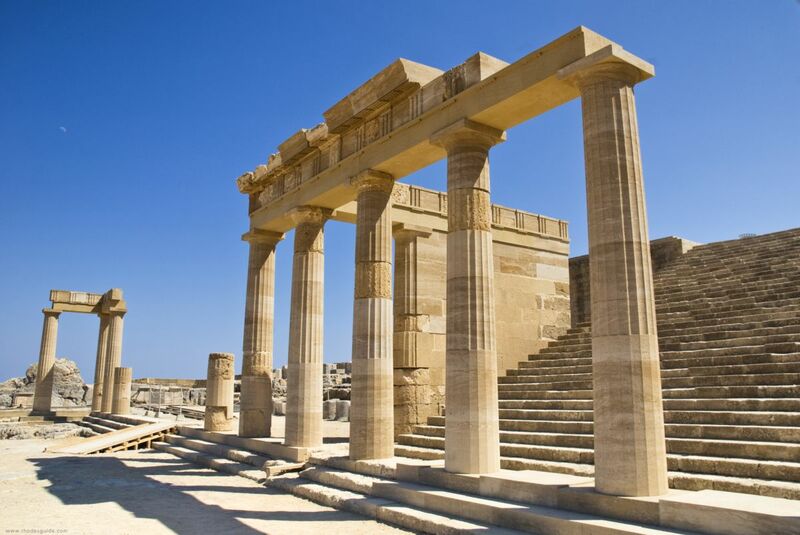 In the recorded history of the Eastern Mediterranean, Minoans from Crete settled on Rhodes. Those Minoans lived peacefully on the island for many centuries, until another tribe arrived against them. The newcomers were Greek Achaeans from the Greek mainland. Around 1400 BC, the Achaeans founded a powerful state that very soon extended its influence. Centuries later, the bellicose Dorians came to Rhodes and developed Lindos, Ialysos and Kamiros. Those three cities finally grew immensely in power and wealth. Located in such a strategic position, Rhodes quickly gained fame and wealth. Fast Rhodian ships sailed everywhere in the Mediterranean, bringing riches and glory back to motherland. Between 1000 and 600 BC, Kamiros, Ialysos, and Lindos, colonised many areas along the west coast of Asia Minor, Sicily, France and Spain. Initially, those three cities maintained their administrative independence, but later united with three other Doric cities, Kos, Knidos and Halicarnassus, to form a federation of six cities, the so-called Doric Hexapolis. In the 5th century BC, Rhodes suffered many changes as a result of warfare. For a short period it came under the influence of the Persians. When the Greeks defeated the Persians, Rhodes became a member of the Delian League under the leadership of Athens. During the Peloponnesian War (431-404 BC), the Rhodians decided to found a new city by uniting the three largest cities on the island. They were very aware of the meaning of the motto "power in unity". The new city was called Rhodes, after the island itself. 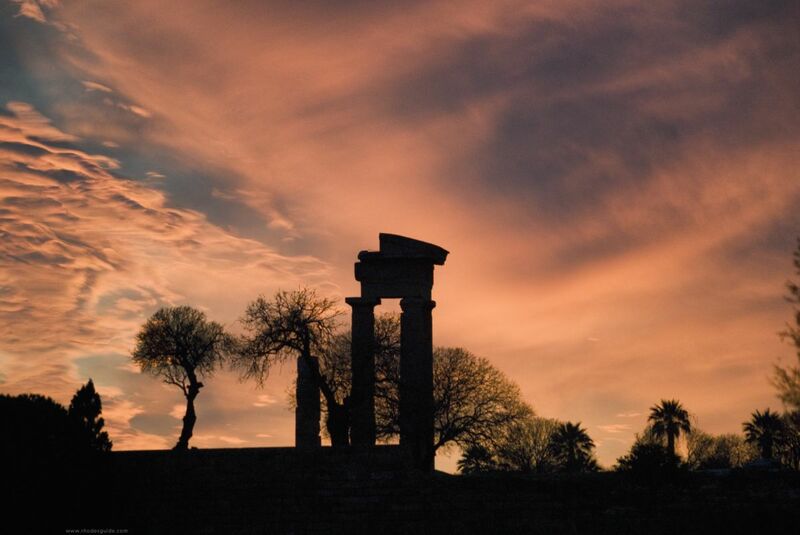 Its foundation in 408 BC constitutes a landmark in the history of the island. The new city came under the influence of the two great Greek powers of that time, Athens and Sparta, until Macedonian intentions in that era became clear to all people of the ancient Greek world. The Rhodians lost no time in siding with the Macedonians. Later, during the siege of Tyre, they helped Alexander the Great to conquer it. When Alexander's empire fell to pieces, Rhodes developed close trade and political relations with the Ptolemeus Dynasty of Egypt. This was a 'casus belli' for Antigonus, the King of Syria, who in the summer of 305 BC sent his son, the famous Demetrius Poliorkitis (the 'Besieger') to capture the town of Rhodes. The Rhodians, protected by their mighty walls, managed to resist capture for a whole year and forced Demetrius to raise his siege. Demetrius's failure to conquer the island marked the beginning of a new era for Rhodes, during which trade and marine activities reached their peak. The Rhodians, in their effort to show correct maritime conduct, put into effect the so-called 'International Marine Law of the Rhodians', a code of law which is one of the most important early legal documents in the world. The intervention of Rome in the affairs of Greece and the Eastern Mediterranean became noticeable from the end of the 3rd Century BC. The Rhodians maintained a friendly stance towards the Romans. However, the Romans wanted to restrict the power of the island. They found a pretext to declare Delos a free port. This strangled Rhodian commerce, and Rhodes was compelled to sign a treaty obliging it to have the same friends and enemies as Rome. This agreement proved disastrous for Rhodes. Nevertheless, after the assassination of Julius Caesar, the Rhodians refused to aid Cassius against his enemies. He attacked and conquered the Town in 42 BC, destroying a large part of the island and taking away more than 3,000 works of art. Rhodes, strategically positioned near the Holy Land, accepted the new ideas of Christianity with ease. According to tradition, St Paul himself preached the new religion at Lindos in 58 AD and converted many of the inhabitants. As early as the 1st Century, Rhodes had a bishop, Prochoros. When the Roman Empire split in two, Rhodes was often overrun and destroyed by enemies such as the Persians, Saracens and Seljuks. 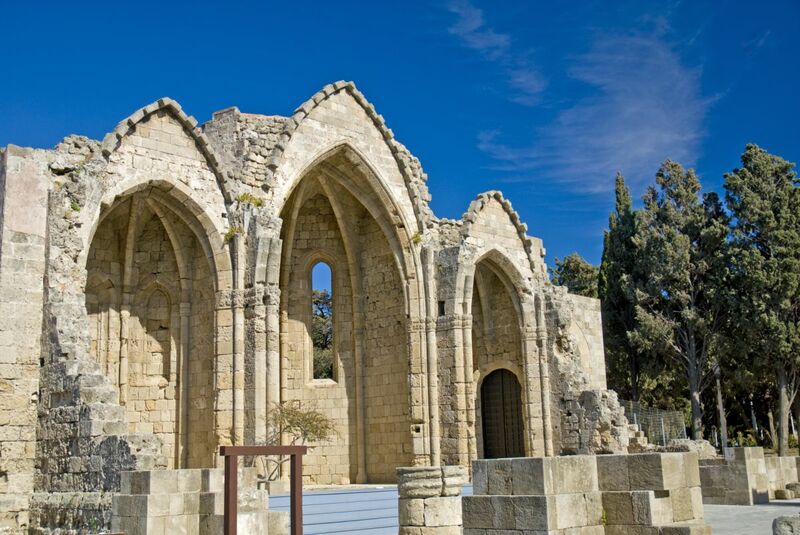 Rhodes did not have any direct communication with Western Europe until the 11th Century. In 1082, the Venetians where given the right to set up a trading station in the port. A century later, Richard the Lionheart and King Phillip of France arrived with a fleet to enlist mercenaries for their crusade. The crusaders conquered Constantinople in 1204, and a rich landowner, Leo Gavallas, from the former capital of the Empire, declared himself Despot of Rhodes. The Byzantine emperors captured their capital back from the Crusaders in 1261, and Rhodes theoretically returned to their control. In fact, the island was under the Genoese admirals whose fleet remained in its harbour. In 1306, one of those admirals, Vignolo Vignoli, sold Rhodes, Kos and Leros to the Knights of St John in Jerusalem, who by force had gained full control of the island by 1309. 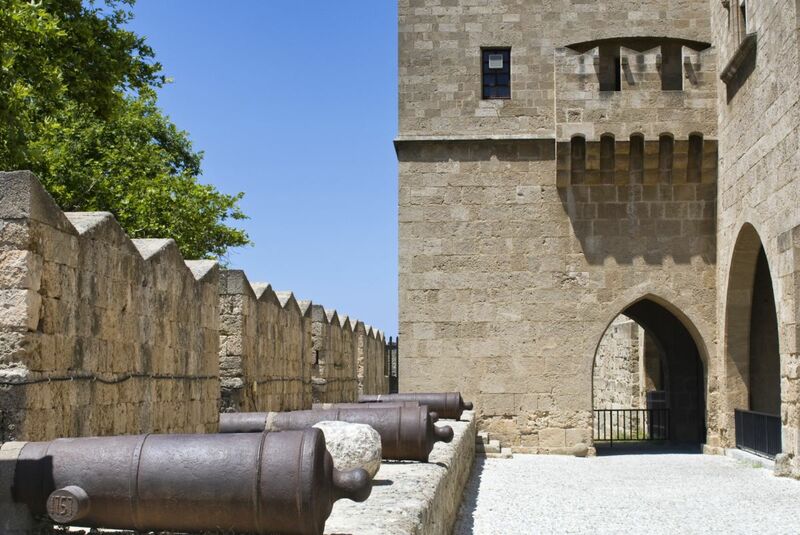 When the Knights ruled Rhodes, the island became the most powerful in Eastern Mediterranean. 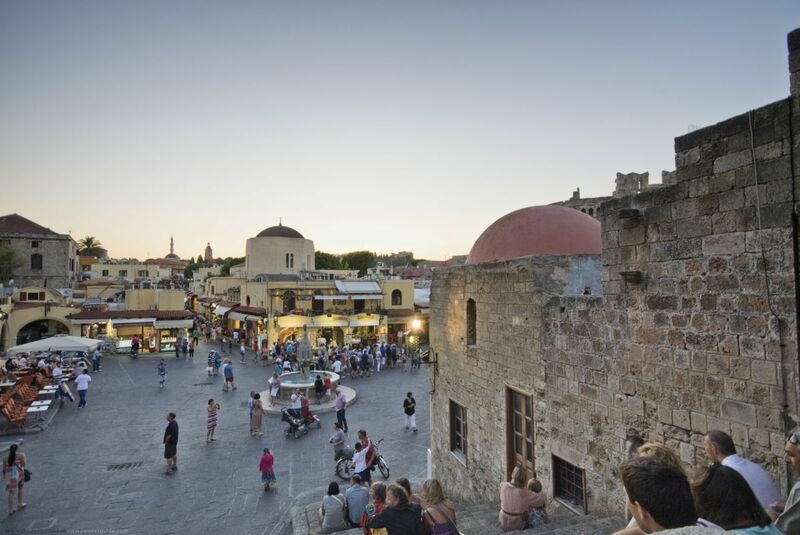 They left imposing evidence of their presence on Rhodes, and gave the city the particular character it retains to this day, with its impregnable walls, gates, churches, hospitals, Inns and palaces. During occupation by the Knights, Rhodes surfaced from the obscurity into which it had sunk after the 7th Century, and acquired considerable strategic and economic importance. It was transformed into a bastion of the West, and an important port of call in trade between Europe and the East. Caviar, textiles of wool and silk, oil, wine, sugar and perfumes, saffron, wax, pepper - Rhodes was the paradise for merchants! Wheat was brought to Rhodes from Cyprus, Asia Minor and, later, Sicily; wine was brought from Crete and Italy. Disputes among merchants were settled in the Mercantile Court of Rhodes, and three galleys protected the sea-lanes on which the island lay. The Turkish occupation of Rhodes was the darkest period in its history, as it was for the whole of Greece. The island was under the control of Kapudan Pasha (a full Admiral). 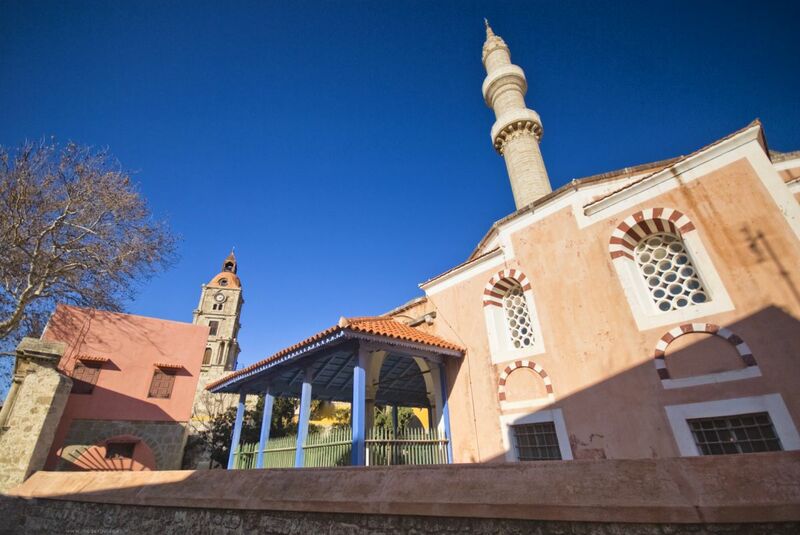 The city itself was capital of the Vilayet (Province) of the Aegean and was the seat of the General Administrator. The Greek inhabitants of the city were forced to leave the walled Town and settle outside it, forming new suburbs which they called 'marasia'. The Turks never managed to attain complete dominance over the island, and the Turkish part of population was always a small minority. During those dark days of foreign occupation, many towns - and especially Lindos - were able to flourish thanks to their stock and production in foodstuffs, clothing, silverware, household utensils and perfumes. Turkish occupation of the Dodecanese lasted until 1912. In that year, the Italians, with the help of the local Greek, occupied the island. At first they treated the local residents well, and hopes of a speedy union with Greece flourished. However, the raise of Fascism led to more expansionist policies, and Italy denied Rhodes the right to self-determination. This was the signal for the beginning of armed resistance. After the defeat of the Axis powers, Rhodes and the other Dodecanese islands came under British military administration until March 7th 1948, when the Greek flag was finally raised over the Governor's Palace. The British bombs that fell on the medieval city of Rhodes in 1944 claimed human lives and destroyed a great number of buildings, leaving large gaps in the urban tissue. One of the first Decrees of the Greek administration designated those areas as reserved for future excavations and a number of edifices as safeguarded buildings. In July 1944 the Nazis ordered the deportation of over 1,600 Jews of Rhodes including men, women, and children of which 1,200 were murdered at Auschwitz.